Partners In Health is a Boston based social justice and health care nonprofit that serves impoverished communities in 10 countries. By establishing long-term relationships with sister organizations based in settings of poverty, Partners In Health (PIH) strives to achieve two overarching goals: to bring the benefits of modern medical science to those most in need of them and to serve as an antidote to despair. 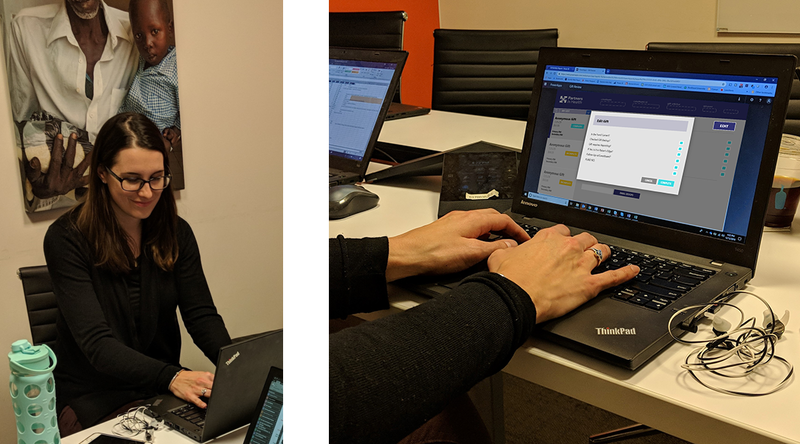 PIH adopted the Power Platform to transform their gift (donation) review process – they use PowerApps for gift officers to review donations and take action, and Power BI for management to get rich insights. The solution was built by Bella Chih-Ning, a Manager on PIH’s Analytics and Applications team who did not have any prior app development experience. Partners In Health relies on its individual donors for about half of its funding each year, while the other half comes mainly from government grants, corporations and foundations. They have about 10 gift officers who are responsible for stewarding their 1000+ most generous individual donors. PIH wanted to improve gift officers’ abilities to manage their portfolios by seeing gifts as they arrive as well giving them a 360-degree view of their donor portfolios. There was no standardization, data governance, or any agreed upon process for storing or sharing information. As a result – important data was getting buried in emails, lost, and confused when instead it could be leveraged to optimize operations and donor relations. They used a CRM system which was old and rigid. It had limited capabilities for reporting or workflows, and gift officers were struggling to gain actionable insights into their data. They also found the user interface to be clunky and had difficulties with access on mobile devices. PIH needed a solution that would standardize data sets, optimize workflows, and enhance overall gift officers’ abilities to manage donations and donors. Bella Chih-Ning, Analytics and Applications Manager at PIH, first learned about PowerApps at a local App-In-A-Day training in Burlington, MA. Bella was familiar with SQL and analytics tools but had no prior experience with application development. After the training session, despite not having traditional development experience, she felt empowered to digitize the gift review process into a consolidated app solution. 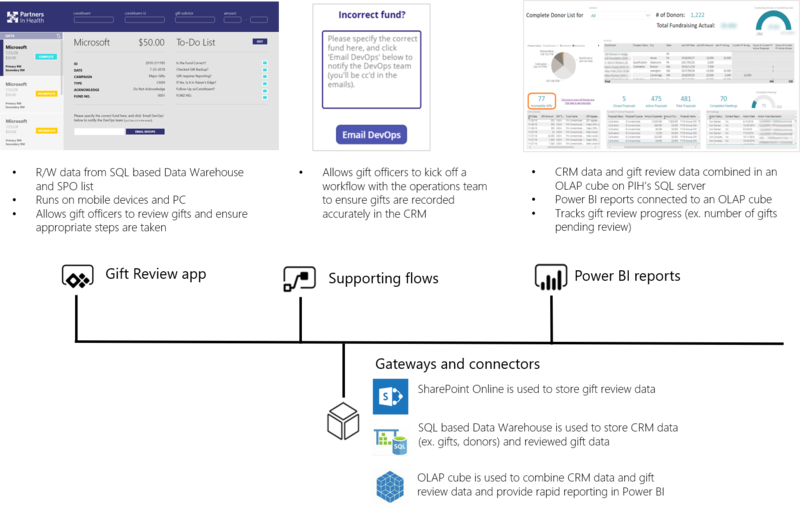 What transpired was a PowerApps canvas app that gift officers could use to manage many aspects of donations, and Power BI reports to gain insights. 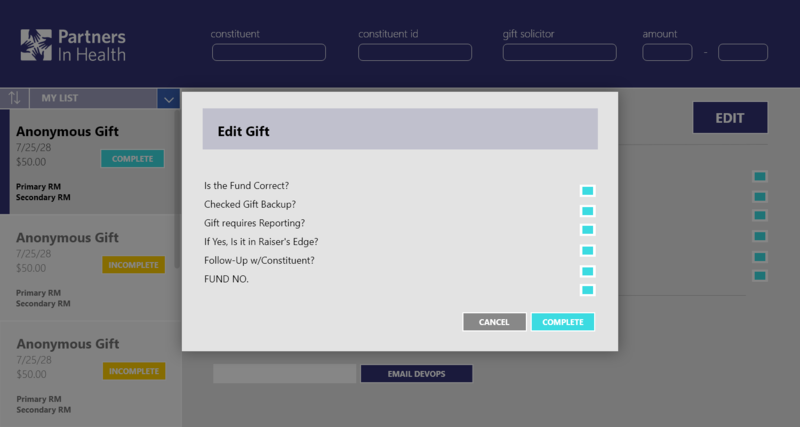 Upon launching the Gift Review PowerApp, gift officers could view donations immediately as they come in, add relevant notes, and ensure they are assigned to the appropriate fund. This creates a To-Do List for them to complete. 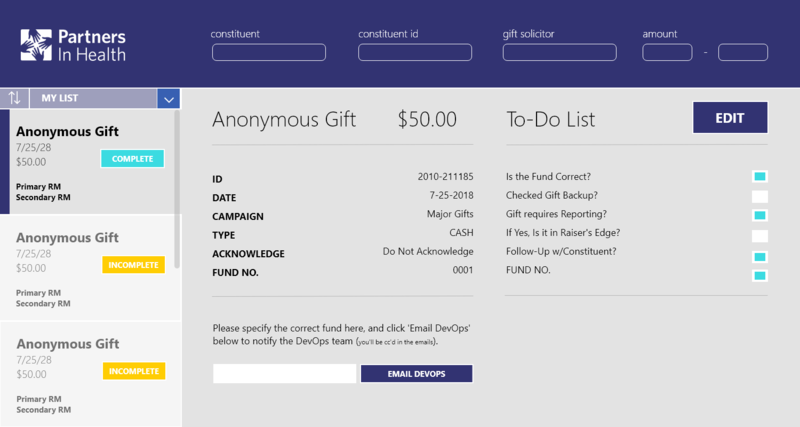 For example, if Microsoft makes a donation, the gift officer would review the donation to ensure it is assigned to the appropriate campaign, coded to the correct gift type, and assigned to right fund. If there are questions, they can email the DevOps team directly within the PowerApp. Once everything is clear, the gift officers mark the check list as “done”, which becomes visible to their managers. Throughout the Gift Review PowerApp development process, Bella conducted requirements gathering meetings with various gift officers, managers, and supporting teams to gain a holistic understanding of the current process, desired process and potential pitfalls. Together they leveraged PIH’s SQL based data warehouse to transform raw CRM data into usable datasets for PowerApps and Power BI. Data is stored in PIH’s SQL data warehouse and SharePoint Online. When gift officers complete the review of a gift, the review data gets pushed from SharePoint to PIH’s SQL data warehouse for reporting. Together, these tools not only give gift officers the visibility they need, they also serve as a management tool when reviewed together with supervisors. Gift officers can work with their managers to ensure they are focusing on the right areas of their portfolios and are on track relative to their individual and team goals. Overall the Power Platform is providing Partners In Health with the tools necessary to raise more money, which ultimately means they can better serve their patients and succeed in their mission to bring first-rate health care to those most in need. 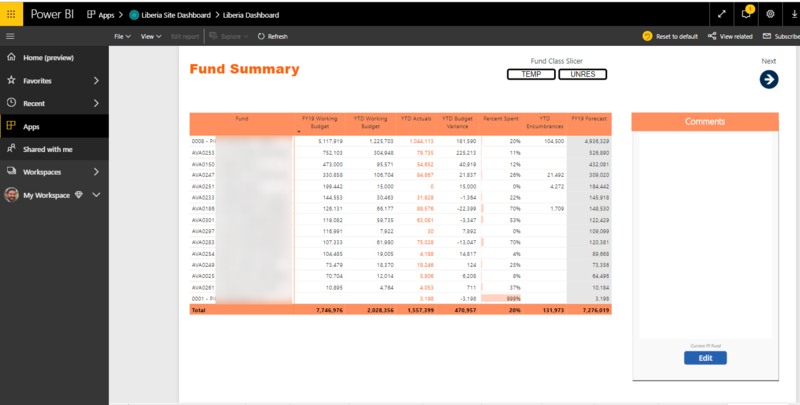 Power BI reports are reviewed quarterly by global management teams. A PowerApp embedded in the Power BI dashboard allows site leadership to explain trends and performances while using the dashboard. 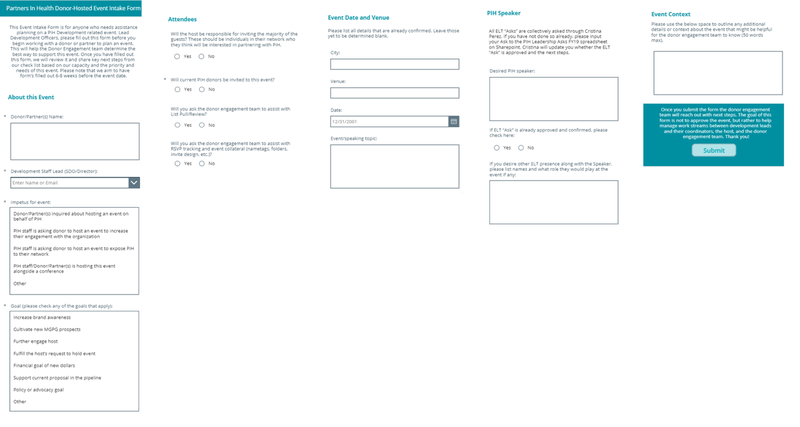 Simple request app embedded in SharePoint for folks to request project management help from the Project Management Working Group. Project Management is one of PIH’s professional development focus areas. Simple request app embedded in SharePoint for folks to request Development Team resources for donor events. 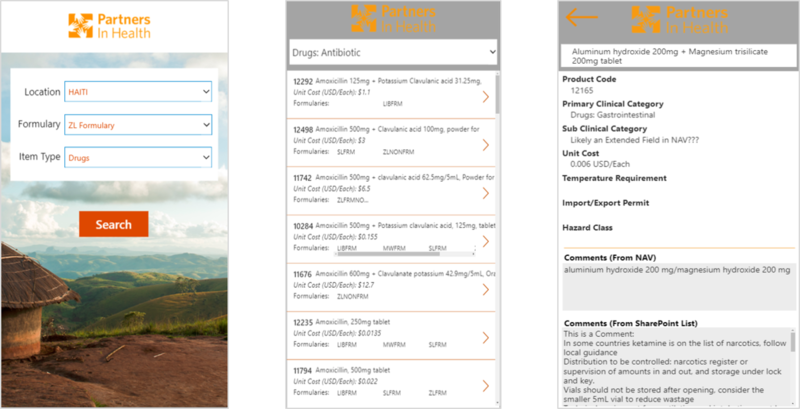 Mobile PowerApp for PIH pharmacists and clinicians to view what medicines and medical supplies are on the PIH formulary, including relevant details for each.